The Chief Ashkenazic Rabbi of Israel, Rabbi David Lau, visited the northern kibbutz Beit Hashita as part of his extended trip leading up to the High Holidays. 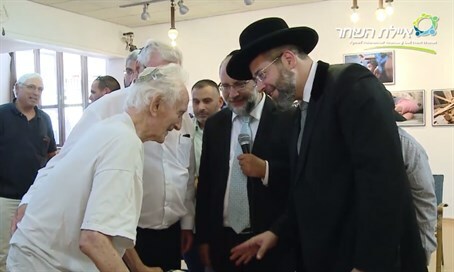 During the visit the Chief Rabbi met 80-year-old Hanoch Albleck, a member of the kibbutz who formerly sang with the band Givatron. Albleck sang the classic song "Unetane Tokef" [Let us speak of the grandeur], as composed by Yair Rozenblum. The song was written in memory of 11 Irgun fighters from the kibbutz who were killed in the Yom Kippur War. Rabbi Shlomo Ra'anan, the organizer of Rabbi Lau's visit to Beit Hashita, and other members of the group "Ayelet Hashachar," recorded the unique meeting between the rabbi and the elder-kibbutznik, while those present joined as an improvised choir.